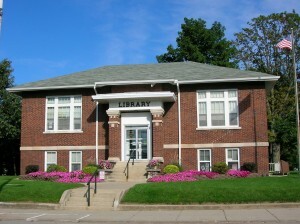 The Van Buren Public Library serves the residents of Van Buren Township. Local residents have been enjoying the library’s resources since 1919. The Van Buren Public Library was established with a donation from the Carnegie Foundation. We are still operating in the original Carnegie building. Our mission is to serve the residents of Van Buren Township by meeting the educational, informational, and recreational interests and needs of all residents, in cooperation with other libraries and community partners. Please note that the library is currently repairing the downstairs children’s room. During this time, the children’s area will be completely closed off until the repairs are complete. However, we do have a limited amount of children’s book upstairs for patrons to check out. We apologize for any inconvenience. A pictorial review of Van Buren High School’s Alumni spanning from 1913 to 1965.